So the Legend of Mothman is a story every American should know. This is our Loch Ness monster so to speak. Everyone knows about Big Foot and he’s a little overrated and over discussed. The origin of Mothman is something of large debate and many locals in West Virginia state, where the creature was originally spotted, there are a few stories floating around about this beast. 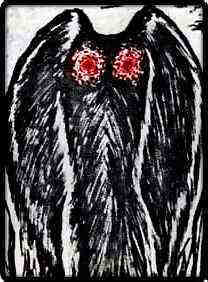 The first sighting of Mothman came from a woman who was driving home late one night and a large man like creature walked out into road. She slowed down and he “spread his wings” and flew away. She never reported it and most people didn’t report the sitings because no one would believe. Have you ever seen a U.F.O.? Who would believe you if you did? The area near a town called Point Pleasant was home to the creature, it’s called the TNT area. During World War II ammunition and reportedly some other toxic chemicals were stored in domed shaped land formations. Some of these toxic chemicals leaked out into the near by lake and could have caused an animal to mutate. Mothman has been dismissed as a mutated Sandbill crane, which has giant red patches on its head. One of Mothman’s biggest physical features that everyone seems to remember are his two large red glowing eyes. The creature has been seen by so many different people and in many different areas.Where the hell is it at now? There’ s a lot more to the legend then what I’ve mentioned, but hey it’s fun to do a little research yourself. I don’t think I could handle seeing a creature like this. A seven foot tall moth like man with giant glowing eyes that sounds like a woman screaming chasing you down the street in your car. No. No thank you. It’s a shame that this creatures are so damn hard to find these days. There hasn’t been any Mothman sitings for a while now. Maybe the phenomenon died. Or it sleeps for a years at a time. Maybe that’s where they got the idea for Jeepers Creepers. I’m surprised no one has a photo or video of this creature. They had cameras in the 60s when it was first reported. Then again the photos would be poor quality. The most recent Big Foot sighting was grainy. This doesn’t make sense to me. We had HD technology people. Hell, even cell phones have decent cameras with 8 megapixels.